Construction of a first multidimensional activator was a fascinating experience. Its superposition was preceded by a few-week creative passion and many underslept nights. Merkiva set in more and more, especially during the final stage of works. It appeared in my mind, fascinated with its shape and supplied information about itself, just like a living being. This knowledge appeared to be more revealing than I had expected. It turned out that we deal with a completely different approach to Sacred Geometry as the Multidimensional Mer-Ka-Ba fields position themselves and spin differently than we have so far imagined; quite differently that we had been taught about it! In a traditional approach, the Mer Ka Ba field takes the shape of two spinning and interpenetrating energetic tetrahedrons. The male tetrahedron, with its top up, spins to the left while the female tetrahedron, with its top down, spins to the right. It is also claimed that they spin at asynchronous speed. While the male ‘pyramid’ does 34 turns, its female equivalent does only 21 turns within the same period of time. 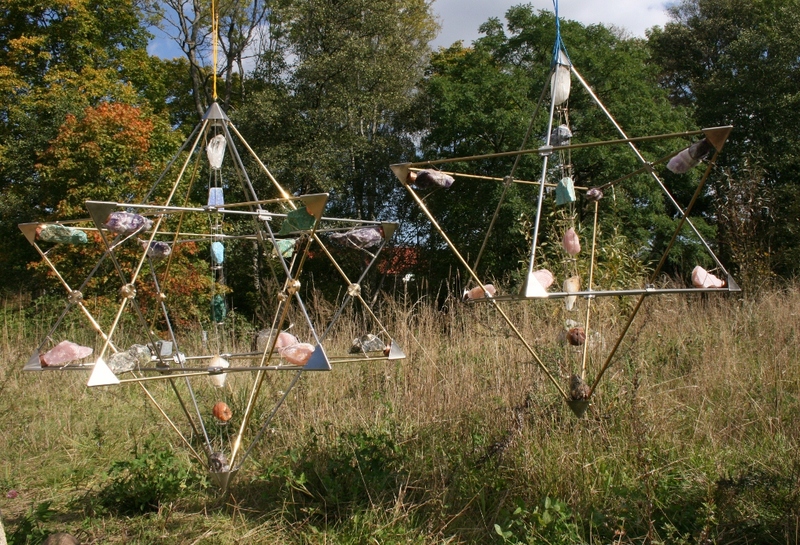 Students of Mer Ka Ba courses are guided through an interesting but intricate process of dispelling both tetrahedrons, connected with visualization and counting of breaths. Repeating commands connected with counting often brings quite a reverse result; instead of gaining a meditative focus, it leads to tiredness and irritation. There is nothing strange in it as counting requires the activity of a left brain hemisphere. The contradiction here is that during meditation the activity of left brain hemisphere is not to be stimulated but silenced to the benefit of experiences coming from right brain hemisphere. Dispelling single tetrahedrons, and what is more with different speed, is practically very hard and requires an immense focus which we not always can afford. If our awareness is directed into something different (and life demands constant focus on many different things), the tetrahedron’s spin ceases and human life field returns to everyday, ‘shrunk’ dimension. The ancient messages state however that the awaken and intensively vibrating Mer Ka Ba Field is a natural state of highly developed beings. Natural meaning achieved in a natural, intuitive way. Moreover, this field has been developed into a multiarm star with a highly developed structure than the traditional Mer-Ka-Ba. The said field is also multidimensional which means it allows permeating of many dimensions. Now, let us try to consider what such a field would look like. 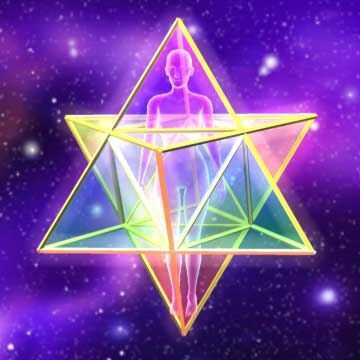 Based on the received messages, a multidimensional form of Merkaba is called Merkiva. Various Merkiva visualizations can be found in different sources. They are usually advanced versions of the Platonic solid. One of the possible extensions of such solids is an asymmetric, 12-arm star. I have tried to make such a model as I assume that if something is to work on a subtle, energetic level than it should also be clearly felt after its physical model had been created. It was exactly the case of Merkaba physical reflection of which turned out to be an instrument wonderfully initiating spiritual energy and enforcing the power of thoughts. Thus, the extension (advancement) of Merkaba to Merkiva should give an explicit quality leap. This theory, however, has not found any support in practice, Extended to a 12-arm star Merkiva does not provide expected energetic benefits because it is asymmetric and non-polar. Please, bear in mind that the whole human energy system is based on polarity thanks to which the energy flow in human bodies is normal. The chakras spinning to the right or left supply us with either male or female energy. This way they create the alternate attraction of potentials. The spinning chakras function as pumps, ensuring constant transport of life forces. Obviously, there is something missing here! It was the first impression when, had you accustomed yourself with the Merkiva, you look again to Merkaba. The Merkaba is clearly missing dimensions. As if they had once existed but then they have been cut off! Was the situation not the same with our whole world? The Earth, once a beautiful planet of paradise, inhabited by divine beings of comic origin, living in harmony with nature, became a place in which struggling became a major paradigm of life and everyday reality is created in the process of a strenuous work. The Earthians lost their multidimensional DNA code, and with this loss they forgot their divine features. Their fields of life energy become limited to only two tetrahedrons with a very restricted mobility. It has got as many as 14 alternate poles! The main negative pole is shaped on the complex 13th arm (it consists of 2 joined Merkaba – male and female). This pole ensures communication with energies of the Earth. In the energetic body it corresponds to basis chakras (root chakra together with a few chakras situated outside the physical body). The main positive pole is shaped on the complex 14th arm It ensures communication with energies of the Cosmos. In the energetic body it corresponds to the crown chakras (the crown chakra plus few higher chakras outside the physical body). 12 side arms of the Merkiva represent 12 multidimensional DNA helices. Such construction of the Merkiva is a physical projection of a life field of multidimensional divine being. In the energy system of a living field of Mer-Ki-Va, the spinning motion looks completely different. It is not a single tetrahedron but the whole male Merkaba moves to the right, accompanied by a simultaneous and synchronic left motion of the female Merkaba. A perfect balance between the male and female elements is kept. None of them is either dominant or subjective. The whole human energy system reacts in a spontaneous and intuitive way to the multidimensional Mer-Ki-Va field built up in such a way. A reaction of such type takes place completely spontaneously, as if something that had long been forgotten and yet it is obvious, now returned. With the same easiness you can learn to make the two (male and female) Mer-Ki-Va whirls spin in both directions.